The start of school is just around the corner. So, as you’re shopping for back-to-school supplies such as pencils, crayons, notebooks and erasers, don’t forget to schedule your children’s back-to-school dental checkups, as well. Columbia, MO, dentist Dr. Philip Batson and his team want to make sure your kids greet the new school year with a healthy and happy smile! 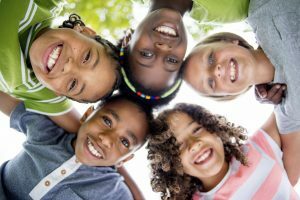 Your Dentist in Columbia, MO, Loves Kids! At Columbia Healthy Smiles, we understand that going to the dentist may not be your son or daughter’s favorite activity. But of course, it is a necessity. So, we try to make their time in our office as enjoyable—and even a bit fun—as possible. We don’t just want to make sure your children’s teeth and gums are healthy. We also want to make sure their early memories of visiting the dentist are happy ones. That way, they’re more likely to make dental care a lifelong commitment. At your child’s summer dental checkup, one of our gentle and skilled hygienists will clean and polish their teeth. We have a rotating brush and special hand instruments that allow us to remove surface stains, so your children’s smiles will be white and bright. And while we know they do their very best to brush and floss their teeth at home, there’s really nothing like a professional dental cleaning. The hygienist and Columbia, MO, dentist Dr. Batson will also check for signs of developing cavities and gum disease. Contrary to popular belief, gum disease is not only a condition that affects older people. Children are just as susceptible to this bacterial infection as are adults. One our main goals at Columbia Healthy Smiles is the prevention of tooth decay. Despite fluoride toothpaste and fluoridation in tap water, this is still a common problem among children. We offer two preventive measures to help your children avoid tooth decay. Fluoride treatments strengthen tooth enamel, the hard outer layer that surrounds teeth and is on the frontline in the battle against decay-causing bacteria. The other treatment is dental sealants. These are “painted” on to your children’s molars as a clear coating that dries to a hard finish. Sealants provide a barrier between bacteria and your children’s teeth. Before the summer runs out, contact Columbia Healthy Smiles to schedule your children’s dental checkups. We serve patients from Columbia, Ashland, Centralia, Hallsville and Fulton.